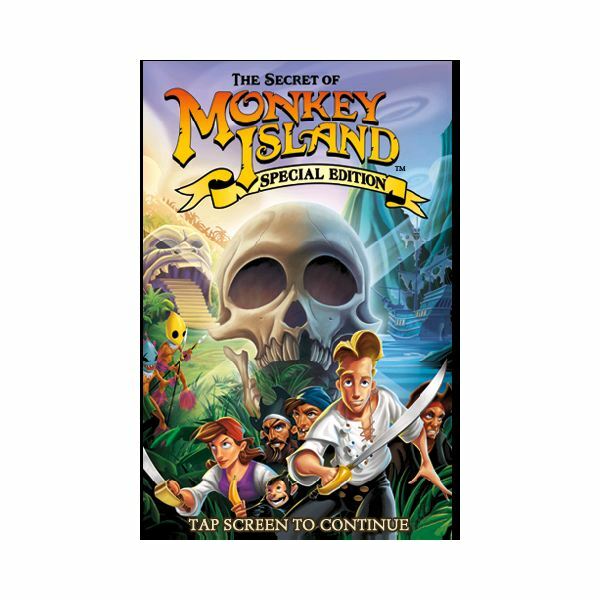 The Secret of Monkey Island is one of the best point and click adventures ever made. You take the part of Guybrush Threepwood a young man who wants to be a pirate. You are given three trials you must pass in order to become a pirate. All done with great humor and wit, the exploration of this game is generally far more fun than simply rushing through it. Still, like with many point and click adventures the Secret of Monkey Island Special Addition can become frustrating when you are wandering through the same areas looking for that one tiny piece of the puzzle that you missed in some random room because it was in the bottom of a box behind a locked door that had a sign that warned of a dangerous live tiger. This walkthrough can help solve that frustration. You arrive on Melee Island with a quest to become a pirate. You speak to the blind watch keeper and discover that the pirate captains are in the SCUMM bar. Follow the path on the bottom of the screen and past the first building and you will reach the SCUMM bar. Pass through the first room and you’ll find three captains sitting behind the door. They will give you the three trials that you must complete in order to become a pirate. The first step in the art of the sword is getting a sword. In order to do this you need to buy one. There is only one good way to earn money on Melee Island. That is being shot out of a cannon. In order to survive that you will need a helmet. So, before you leave the bar you will want to walk to the door on the right side of the room. Try to open this and the cook will yell at you. Step away and the cook will rush out serving food. This is your chance. Ignore his insistence that you not go into the kitchen. There you will find a number of items you will want. First, under the table is a pot. This can be your helmet. Also in this room is a hunk of meat and a pot. Put the meat in the pot then take it out. This will cook the meat. You will also see a bird outside eating a fish. Go outside and go to the far end of the dock. Step on the board the bird is on and it will fly off, and then fly back. Do this until it doesn’t come back. You can then take the fish. Put the fish in the pot and then take it out as well. You can then leave the SCUMM Bar. 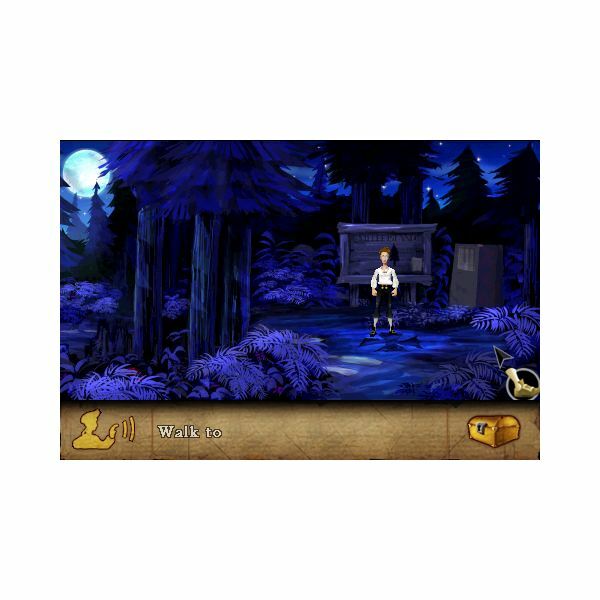 The Secret of Monkey Island iPhone Game Walkthrough Tips continue on the next page. Once you have this you will want to travel from the bar back to where you started and then up through the stone arch and out of town. This will take you to the Melee Island map. Once on this map you will see a few lights. Look for the one near the middle and travel there. This is the circus. Inside the tent you will meet two brothers. Give them the pot and they will shot you out of the cannon. This will give you the money you need for the sword. Now travel back to town past the SCUMM Bar and follow the path until you reach the screen with the church. Just before the church you will see a building. This is the shop. Here you will want to buy the sword. You may also want to buy the shovel for a later trial. Once you have all of these things you need someone to train you. Return to the world map and go the bottom right single light. On the way there you will be stopped by a troll. Give it the fish and you’ll get a cameo. You can then finish the path to the house. Here you will be given the basics of sword mastery, which on Melee Island are insults. You learn two basic insults and then leave. From here you need to wander the map looking for the small dots which are wandering pirates. Use the insults to fight them, learning both new insults and the responses to them until someone says you’re ready to fight the sword master and one of the most fun parts of this classic adventure game. In order to reach the sword master you need to return to the store. Ask the store keeper about the sword master and he will go to ask her to meet you. Follow him and he will lead you all the way to her door. Here you will discover the secret of the sword master. She has different insults than anyone else. In order to defeat her you must use the responses you have learned to match the new insults. This will take some time and you may need to wander more to learn all the insults and responses, but if you continue to return to her house eventually you will defeat her and the hardest of the three trials. In order to prove yourself a great thief you must steal the many handed idol from the Governesses house. You already have the first item you need, the stewed meat. Now go to the fork where you followed the storekeeper and you will find yellow flowers. Take those and combine them with the meat. You can now return to town. Follow the path through town until you reach the Governesses house. You will find a pack of guard poodles there. Give them the meat and they will fall asleep. Go inside the house and into the first door. The sheriff will come in and confront you. You will get a very funny scene and a few items but not actually see anything. Take those items and go to the store keeper. Buy the breath mints from him. Then on the other side of the church go into the jail. Give the breath mints to the prisoner so you can talk to him. Then trade him the gofer repellent for the cake he has. This has the file in it that you need. Return to the Governor’s house, go back into the room and finish stealing the idol through another long scene that you do not actually control. This is by far the easiest of the quests. Go into town and you will find a pirate standing on the corner. Talk to him until he offers you a map. If you don’t have quite enough money go to the other pirates and force them to pay you to give you the minutes to the PTA meeting. Buy the map. Now return to the same fork that you followed the storekeeper through. The map will lead you through this. Replace back with up and simply go the direction that this lists. You will reach a clearing with a sign and a large x. Use the shovel that you bought from the storekeeper and you’ll complete the last of the three quests. You will then return to town to discover the next section of the game in which LeChuck has kidnapped the Governess and you must gather a crew and travel to Monkey Island to save her and the next part of The Secret of Monkey Island Special Edition.